This article will illustrate how to create a Free Custom Shipping Method that applies to orders over $50. In the admin console go to Settings > Shipping > Custom Shipping Methods, and click New to create a new custom shipping method. 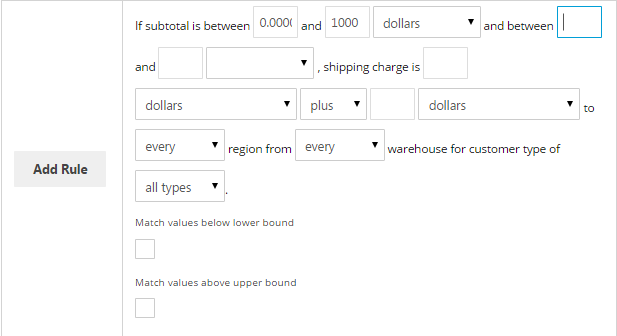 Give the custom shipping method a name and a description (optional). This name is what will show to your customers as the shipping option on the storefront. When you are ready to use this method make sure the Active checkbox is checked. Make sure to click save to go on to make the rules. In order to work the shipping method must have rules. The rule should read out like a normal sentence. In this case we want free shipping on orders over $50. If you want the shipping apply to ANY order, set the range 0 to 999999. The rule requires a lower and an upper value so unless there is an alternate rule, make the upper value very high. The most important fields are the ones that say order is between $ and $, and shipping charge is $. 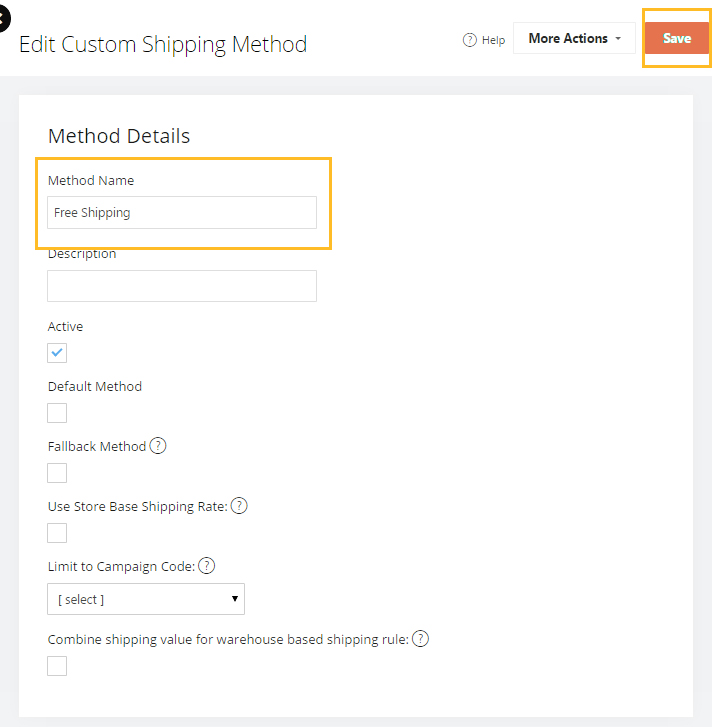 Once you add the rule you MUST click the "Add Rule" button to the left to add the rule to the shipping method. Unless you want different charges when other conditions are met, the one rule is all you will need for the method. Note: In order for the shipping drop down to display on the shopping cart the option must be enabled in your theme. To check if this is enabled go to Themes > [Active] > Shopping Cart > Basic Settings, and make sure the following options are similar. Having the ability and configuration flexibility is awesome. The question is how does one arrive at the threshold amount? That's a good question. However as you've found there is no simple answer or a formula that you can follow all the time. It completely depends on your customer base, your profit margins, average shipping cost, etc. If your average order amount is small and the profit doesn't cover the shipping cost... you're gonna have a bad time. In my experience, the best way is to use a ZERO shipping weight. I have found that amount spent, doesn't necessarily mean you can do free shipping. The product's markup, and the carrier, and shipping methodology you can use will determine that. For example USPS Flat Rate Envelope, $5.05 to ship, vs. using another carrier, which will most likely average out at 7 to 9 dollars, depending on where it's going, weight, and size. I have found that free shipping depends on the product, and shipping means, not total dollar amount spent. I have $3400 products that don't merit free shipping, once the cc charges, are taken into consideration, as well as box, shipping materials, and transportation to the shipping facility. After you analyze your final profit margin taking in to consideration all the costs involved, the ability to use a zero weight for free shipping, allows you to quickly add free shipping via the mass editor on those products you know you can ship for free. Product Ships individually, is another feature that allows me to separate those things that require a separate shipment. Example, if a customer orders an item that requires a 7 ft shipping box, and another item that requires a standard 8x8x8 box, those two things can't be shipped together in one box, so the item requiring the 7FT box, has to ship individually, and the shipping costs must take into account the volume of the box, not just the weight. If you were to combine those weights, the total shipping charges may not add up to enough of a charge, once you set the 7 ft box to ship individually, the shipping calculation will work out correctly, you will neither short yourself, or over charge. Personally I use custom shipping methods that I have created based on the carriers that I use. FedEx, Post Office, and UPS on a few items that I drop ship. In e-commerce you can't marry yourself to one carrier, you need to use whichever carrier makes the most sense for the item you are using, and base your shipping charges on the system you develop.